Donald Trump, Jr. says the media was politically motivated when it promoted a now-discredited BuzzFeed story and when it piled on a group of Catholic schoolboys. Trump Jr. told Fox News on Monday night that the mainstream media is always looking for “the enemy when it reports the news.” Trump said most media outlets jumped on the BuzzFeed report that suggested President Donald Trump counseled lawyer Michael Cohen to lie to Congress and they showed the same enthusiasm for an altercation between some Catholic students and some activists. 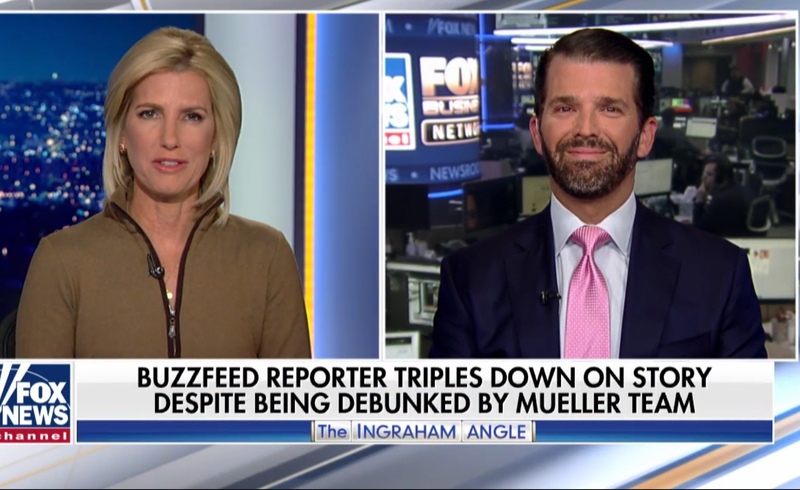 Trump Jr. said the media’s desire to push a political agenda and not just report the news was the same with the BuzzFeed article that has been dismissed even by special counsel Robert Meuller’s team. “They’re basically leftists policing leftists,” he told Fox, adding that the liberal media “have shot themselves in the foot time and time again.” The author of the BuzzFeed piece continues to insist it is accurate. Donald Trump Jr. appears on “The Ingraham Angle” to discuss media bias, Jan. 21, 2019. Fox News screenshot.